I wanted to give an update in relation to our first property auction. I am pleased to advise we managed to achieve a couple of sales and perhaps more interestingly 75% of the properties at the Auction have had an increase in viewing activity and 33% of the properties advertised at the Auction now have parties interested in purchasing. The properties that featured at the first auction were a wide range of interest to all types of buyers and the audience consisted mainly of property investors which was to be expected (I am noticing an increase in property investor deals and I will report on this trend shortly in a future blog). I feel these stats show the potential of property auctions and reinforces the importance of instructing a Firm of Solicitor Estate Agents who have an innovative approach to selling properties. On the back of the success of the first auction I would advise that we are holding our 2nd property auction on the 26th of June. 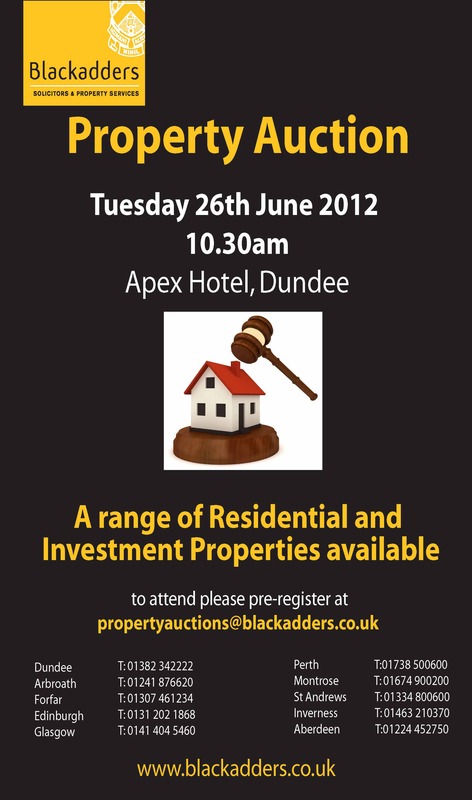 I am delighted that we have again managed to secure the services of Steven Dewar of Curr & Dewar as our Auctioneer and we are hosting it at the Apex Hotel, Dundee. For more information and to register a property or as a bidder please contact the Blackadders’ Property Team on 01382 342222 or via our e-mail address of propertyauctions@blackadders.co.uk. More information will appear in the local press and on our website. I look forward to seeing you on the 26th.